Predominately our firewood came from coppice woodland, meaning that areas of woodland trees are cut on a rotation. It was effectively harvested just like, and in fact, as a crop. The species of tree that make up a coppice woodland are particularly adept at re-growing from a cut stump and so the firewood we cut grows back over a number of years (10-30 years). In the process of harvesting firewood from cutting coppice the woodland floor is flooded with light until the trees grow back up and the canopy closes over. This provides the opportunity for different species of flowers, insects, birds and mammals to move in and the biodiversity of the woodland is increased. By coppicing only a certain area each year on a rotation a mosaic of woodland with a different age and structure is created which means that we create and provide valuable 'edge effects' or 'ecotones'. So not only does using our firewood mean that you have a near carbon neutral fuel, our firewood is directly benefiting wildlife and increasing the biodiversity of the woodlands where we work. See the Woodland Management Web Page Coppicing section. 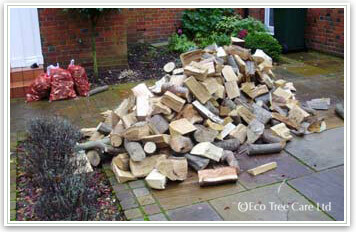 Sales of wood burning stoves in 2008 are 40% up - Can you scavenge your own firewood?? "Wood collecting tradition to end"
Note: Our new orange bags are considerably larger than the green bags hence the £6.50 price tag. They are also filled right up. 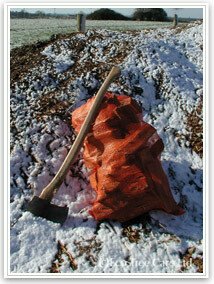 Bags are slightly smaller than the log bags at 50cm x 40 cm when flat. We have two grades of kindling on offer. Many of our customers find that a combination of Woodsman Kindling and Cut Kindling to be a good mix. "Woodsman Kindling" - Unashamedly sieved scraps from the barn floor. Some people prefer the cut type of kindling where logs are split down further into smaller sticks. 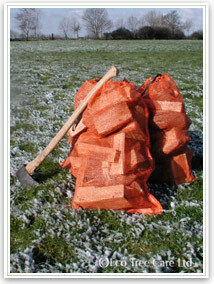 Bags of cut kindling for sale at £ can be added onto any order of bags or loose loads. 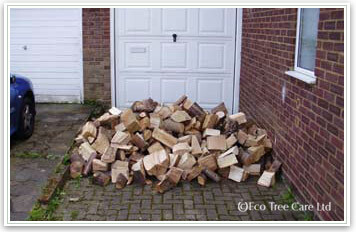 If you are able to accommodate it your firewood can be delivered as a loose load of logs. 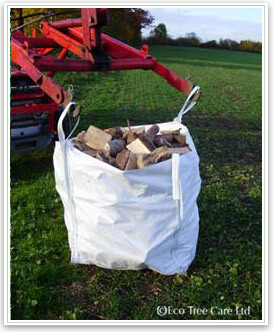 To load up and measure out our loose loads we use bulk bags (see photo) 2 x bulk bags is approx 1.5m3 . This is our standard load. For those that want a smaller volume of logs then we please see the firewood log bags above. Mixed loads of firewood we define as straight from our log piles, no sorting. 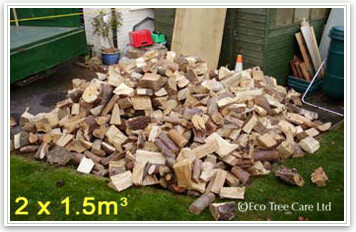 Log sizes range from small (approx 15cm/6") to large logs (approx 45cm/18") as the extremes. The vast majority of the logs will be approximately 30cm/12ft or there abouts. Loading into bags is generally mechanical and so there is no sorting of logs. 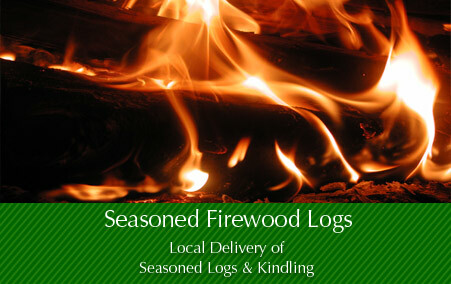 "Selected" Loose Loads of Firewood - Small woodburners, small open fires, pizza ovens e.t.c. 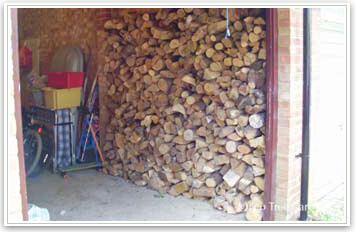 Selected loads of firewood we define as logs of a certain selected size, maximum size or certain types of wood. Some of our customers have small wood burners or small open fires, or request no conifer if the wood is being used to cook food. We can accommodate such requests defining these loose loads as "Selected". Their is an increased cost becasue of the extra time taken to sort through the log pile. 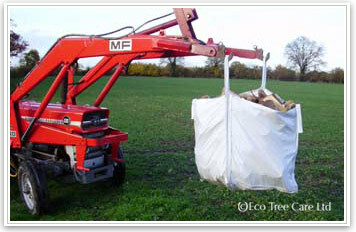 Loading into the bulk bags will be by hand in order to select the desired firewood logs. Note: We tip the logs out of the bulk bags on delivery so we can re-use them. If you would like us to leave the bags with you then we ask for a £5 deposit, refundable on return of the bag next delivery. Note: The approx 1.5m3 is the combined volume of two bulk bags. The volume of the logs if stacked neatly and carefully will undoubtedly be less than 1.5m3. For clarification we are selling volumes of bulk bagged logs not actual volumes of wood prior to splitting or when stacked neatly. Occasionally it may be possible arrange a pick-up of our Firewood logs from the yard. This must be by prior arrangement only and my not always be possible as our yard is not open to the public. * Note: Firewood delivery is to the drop off point only i.e. to where the delivery vehicle can back up to. Very occasionally we may be able to help carry bags or stack logs. In cases where unloading requires a distance to be carried or wheel barrowed, up/down steps, through houses, e.t.c. we would have to ask for a donation for our time and extra work involved. If this is the case please tell us before we deliver so we may bring a wheelbarrow or carrying bins e.t.c. 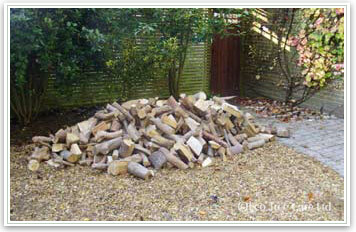 Do you have neighbours who also use firewood logs to heat their homes? If so we encourage shared deliveries of logs to save on our time and more importantly the fossil fuel used in delivery. It can not be over-emphasised that the key to good firewood and therefore a good fire is well seasoned logs. Seasoning can only happen with time and dry airy conditions. The water content can be as high as 45 - 50% in freshly cut logs. Well-seasoned firewood will have a moisture content of around 20-25%. Poorly seasoned logs will burn slowly and inefficiently. A certain amount of the heat of combustion will be used up drying out the wood before it will burn. The fire will be cooler, and will produce more smoke. The smoke produced will contain more particulates and complex hydrocarbons further reducing the efficiency of the conversion of wood to heat. Dry firewood logs will burn with very little smoke. They will burn with a hot and efficient flame to give carbon dioxide and heat. Less smoke, less particulates, means less pollution. When logs are burnt un-seasoned they will burn cooler and with much more smoke. The cooler the fire the less the chimney will heat up. A cool chimney and chimney flue will result in condensation of the volatile components of smoke onto the inside of the chimney. The resulting deposit will consist of creosote, which is formed by the flammable particles in the smoke remaining unburned. This is because there is not enough heat in the fire, resulting in incomplete chemical reactions. Creosote can eat away at the linning of your chimney. As above un-seasoned firewood can increase the rate at which unburnt chemicals are deposited on the lining of your chimney. It is possible that these deposit can re-ignite resulting in a chimney fire. Not only can this damage your chimney but in worst cases it can spread, it is then no longer a chimney fire but a house fire. Before moving to Chilham, in Kent, Martin also worked as a retained firefighter in Much Hadham, Hertfordshire and regularly is called to chimney fires during cold weather. Especially dangerous for thatched houses. Always burn seasoned firewood and have your chimney regularly swept by a chimney sweep. The Combustion of Firewood - "The technical bit"
Martin originally graduated with a degree in Chemistry from the University of Nottingham before starting life as a woodsman 6 years after graduation. Hence the technical explanation below comes from a need to understand what is happening at a chemical level when burning firewood. Cellulose C6H10O5, Lignin C9H10O3 (OCH3) 0.9 - 1.7, Hemicellulose C5H8O4 e.g. Xylan. They co-exist together in varying proportions depending on the species of wood, also in the mix are varying resins of different compositions and small amounts of mineral substances that yield ash when burned. What follows is a more detailed analysis of what makes up your firewood. What exactly are we burning when we put our logs on our fires? Cellulose is a polysaccharide of beta-glucose. In other words, it is a repeating chain of a particular type of glucose sugar molecule, to form a polymer. (Poly - 'Many'; -saccharide 'sugar'). The chains are in the order of 7,000 - 15,000 glucose molecules per polymer. It is the primary structural component of green plants. The cell wall of green plants is primarily made of cellulose and the secondary wall contains cellulose with variable amounts of lignin. Lignin and cellulose, considered together, are termed lignocellulose, which is essentially wood. It is argued to be one of the most common biopolymers on our planet. In combination with lignin and hemicellulose, it is found in all plant material. Cellulose is flexible in comparison to lignin which is rigid. It like the steel rods within reinforced concrete. It gives flexibility to the structure. It is strong in tension, weak in compression. Cellulose was discovered and isolated in the mid-nineteenth century by the French chemist Anselme Payen. Cotton fiber is naturally occurring almost pure cellulose. Our firewood is full of it! Lignin is a complex, highly cross-linked aromatic polymer that is most commonly derived from wood and is an integral part of the cell walls of plants. Therefore in our consideration of the burning properties of firewood it is a major player. Unlike cellulose, which has an ordered and predictable molecular structure, lignin consists of various types of substructures which appear to repeat in a random manner. The schematic diagrams to the right show portions of it's complex structure. Lignin has several unusual properties as a biopolymer, it has a network structure and it lacks a defined primary structure. In reality the cross linking means that there are covalent chemical bonds between different parts of the molecule so it is impossible to say where the molecule starts and finishes. Where the molecule starts and finishes makes no sense, it is a network. It is one of most abundant organic compounds on earth after cellulose. When talking about wood we know that Lignin makes up about one-quarter to one-third of it's dry mass. Lignin fills the spaces in the cell wall between cellulose, hemicellulose and pectin components. It is also covalently linked to hemicellulose as well as within it's self. Lignin is rigid in it's nature so it is what gives mechanical strength to the cell wall and therefore the entire plant. In our reinforced concrete metaphor, it is the concrete around the flexible steel internal rods. It is weak in tension, strong in compression. Therefore it is particularly abundant in compression wood, but scarce in tension wood. Burning lignin yields a range of products, of which the most characteristic ones are methoxy phenols. In cooking, lignin, in the form of hardwood logs, is an important source of these chemicals which impart the characteristic aroma and taste to smoked foods. It is generally considered better to have more hardwood than softwood in the firewood mix. See later for our evaluation of different types of wood and their properties when used as firewood. Lignin yields more energy when burned than cellulose. A hemicellulose can be any of several heteropolymers (matrix polysaccharides) present in almost all cell walls along with cellulose. While cellulose is crystalline, strong, and resistant to hydrolysis, hemicellulose has a random, amorphous structure with little strength. Hemicellulose is a polysaccharide, like cellulose, but otherwise has no chemical relationship to cellulose. It consists of shorter chains - around 200 sugar units as opposed to 7,000 - 15,000 glucose molecules per polymer seen in cellulose. In addition, hemicellulose is a branched polymer, while cellulose is unbranched. Hemicelluloses include xylan, glucuronoxylan, arabinoxylan, glucomannan, xyloglucan, arabinogalactan II and galactomannan to form part of the plant cell wall matrix. Xylan, also known as wood gum, is a yellow, water-soluble, gummy polysaccharide found in plant cell walls. It is a polymer of xylose. Xylose, C5H10O5, which is also known as Wood Sugar is a 5 carbon ringed molecule. It is found in the embryos of most edible plants, and is said to be one of the eight sugars essential for human nutrition. Xylans are almost as ubiquitous as cellulose in plant-cell walls and contain predominantly beta-D-xylose units linked as in cellulose. Some xylans contain other sugars, such as L-arabinose, but they form branches and are not part of the main chain. Xylans are of little commercial importance. Glucuronoxylan is another cell-wall polysaccharide. It contains glucuronic acid and xylose as its main constituents, having a beta (1-4)-xylan backbone, with 4- O -methylglucuronic acid side-chains. Arabinose and acetyl side-chains may also be present. Studies have demonstrated that glucuronoxylan gived a certain amount of plasticity as a constituent of wood fibres. In truth, where it is possible to isolate various components of wood. They are all molecules with organic chemistry so there are chemical and covalent bonds interlinking them all to make what we know as wood. The different species of wood will have different relative amounts of these components, with different interlinking and different side chains on the parent molecules in varying positions and orientations. The polymers making up wood have been made by the tree by trapping solar energy from the sun, and using this energy to combine Carbon dioxide from the air with water. This is done by chlorophyll in the leaves by the process of photosynthesis. Carbon dioxide and water molecules are very stable molecules i.e. the atoms in the molecules 'like' to be combined together in this particular 'pattern' or 'orientation'. Carbon dioxide and water are simple molecules with simple bonds and not many atoms. In contrast the polymers of wood are energy intensive molecules, they contain many many atoms and are arranged in complex patterns, with many bonds. They are 'full' of energy, and exist only because of the abundant energy from the sun that has been used to create them. The plant has effectively locked up this solar energy and stored it as complex wood molecules. Essentially all wood, regardless of species, contains roughly the same amount of energy per kilogram. The variable is only the density. However different species do have different burning properties - discussed later. The rate of photosynthesis is dependant on the intensity of light, the concentration of carbon dioxide, and the temperature. When we burn firewood we are effectively reversing this photosynthetic reaction to release the sun's energy as heat, light and sound. When burning our firewood you are releasing energy from our star, the sun - this star energy has been released as photons during the nuclear fusion of Hydrogen into Helium which has then traveled 92,950,000 miles through space taking 8 minutes 19 seconds (Ref.). It has then struck a leaf containing chlorophyll on a tree, which happens to be in its position on the planet that is in 'daylight' during the earths daily rotation. These photons are 'trapped' as they are used to convert carbon dioxide and water into a complex high energy molecules and laid down to be stored as wood. After many years the tree has found itself in a situation whereby it has been removed and cut up into logs for firewood. The log is then stored for at least a year so excess water is expelled. When the log has seasoned it is fit to be called firewood and is delivered to you where it is stored in your log store until such time that it is cold enough for you to wish to make a fire. The firewood is arranged and energy is put in as a flame. The heat of the flame causes the complex molecules to split up and release flammable gases which burn with oxygen to give carbon dioxide and water. The trapped star energy is released as heat, light and sound warming the living room and the spirit. Lovely! A brief synopsis of various tree species and their qualities when split and cut into firewood. Each description contains a 'Firewood Burning Properties' section giving a series of adjectives to describe the wood when burnt. Firewood burning connoisseurs may select which of the logs they have available to add to their fire at any given time. Knowing the burning properties of different firewood means that if a fire needs quickening up a bit or slowing down a particular log will do just the job. Or if a log is a poor or mediocre burner then it may do well to combine it with logs that will keep it going. It is worth remembering that all wood is trapped solar energy and given the right conditions and seasoning can be efficiently made to release it. Next is a 'Log Frequency' giving a rough guide to the chances of finding that species in our deliveries of logs from our seasoned log pile for supply during 2012. This is based on the predominance of the woodland management projects we have been doing within Cutlers Wood in Chilham and the woodland and tree work within the local area that has gone into creating this seasons firewood log pile. Ranging from 1 - Rare up to 10 Most Likely. As a firewood alder is not considered to be excellent for it's heating properties. It is a soft porous wood and tends to burn quickly with a bright flame. It is said to give off relatively little heat, but this is difficult to assess when in the firewood mix. Because it burns quickly it is not a bad log to have when mixed with slow burning firewood species like oak and beech and can be useful when starting a fire. From an aesthetic point of view it is a good looking log because of it's rich pinky brown colour. A nice one to have by the fire. 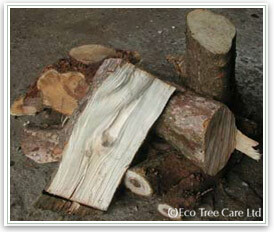 Apple wood is considered to be a real gem of the firewood selection. It is not particularly common when compared to some of the other native trees that we come across in our working life although in our region around Chilham there are of course many orchards and so we hope that in the future we will be able to increase the predominance of this species. If you are lucky enough to find some in your firewood delivery then keep it for special occasions. It gives off a beautiful smell. Also for this reason it is highly prized for cooking food because of the most excellent flavour that it gives to food and it also burns with a soft flame, glowing hot rather than with big flames. Ash is arguably the best firewood. It burns very well with a strong consistent and bright flame. Ash logs produce an excellent heat and are easy to light. There is a rhyme "Ash, mature or green, makes a fire for a Queen." and another "But Ashwood wet and Ashwood dry A King may warm his slippers by". (See the firewood rhymes below) Ash as firewood indeed does burn unseasoned (however the same considerations apply to burning unseasoned wood as any others - see above). Not only does ash burn well, it has a lovely smell when burning and it splits very cleanly and easily. 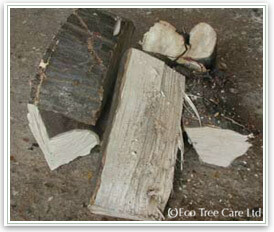 The reason ash is a good firewood is due to the high content of oils in the wood. Ash is in the same family as olive trees - The Family Oleaceae. Beech is a excellent firewood, it burns long and with a high heat. It is dense and relatively slow burning. We find that beech does best when combined with other faster burning logs as just on its own it can burn just a bit too slow. A beech log will be heavy and solid, as a firewood its carries on these qualities. One of our favourite firewoods and a good looking log too. 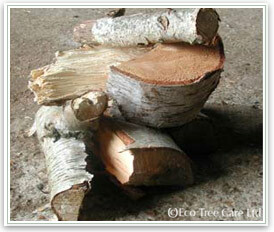 Sometimes we have had requests for silver birch logs to have just for show by the fire as they are so pretty. It splits easily and creates a good fire with a bright hot flame. Just like it grows and dies it burns similarly quickly so it is good mixed with slow burners like oak and beech logs. The bark, which sometimes on the larger logs, peels off easily makes an excellent fire starter. This is the wood to select first if trying to light a fire out of doors and everything is wet. It can be burned unseasoned and will light, eventually, even when wet. A very heavy firewood. It is slow to light when a large split log, easier when small and in the round, but once alight gives a strong dependable flame with plenty of heat. Best added to the fire once established. Small round logs are shiny black bark, smooth and tough looking. Wonderful smelling and resinous wood. The logs burn with a soft flame which is steady and hot. It is a good wood to cook food over because of the absence of large flames. It does occasionally spit, but not badly. A fire with cedar logs will have bright red glowing embers. A slow burning firewood but giving out lots of heat. Good looking logs with a rich heartwood colour. 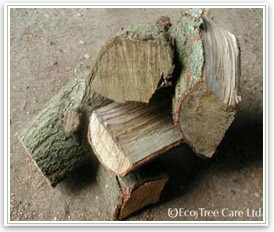 Bark on larger logs can peel off to provide useful fire starting material. Logs of cherry split easily into firewood, heavy, dense, solid. An excellent log, another of our favourites. Pleasant scent. Slow Burning with lots of heat, Splits easily. Solid and dense. Elder burns very quickly and with little heat, the wood is light. It also burns with a cloying smoke. Traditionally burning elder was said to be bad luck or would bring evil spirits into the house. It may be that it not being a good burning wood, and very smoky contributed to this folk lore. We don't consciously have elder in our firewood log mix. All attempts are made to prevent Elder being added to the firewood log pile. Very rarely an elder stem may inadvertently find its way into the pile, but this shouldn't happen so you shouldn't find elder in your mix. If you have a woodburner it is not such a problem, should be avoided with an open fire. Elm logs need to be seasoned extremely well. The famous firewood rhyme says that Elm burns like smoldering flax. The other rhyme says that it burns like 'churchyard mould'. The reason for this is that when a live elm tree is freshly cut, the wood has one of the highest water contents. Very often this is not a problem as it usual for the elm logs in the firewood pile to come from dead elm trees, which have reached a certain size before succumbing to Dutch Elm's disease, so they have often air seasoned for many many years as dead trees before being cut down. Dead elms are very often seen in overgrown hedgerows, straight poles with stag-headed branches, rarely over 15 cm in diameter. A good burning log but must be seasoned properly. This is because the wood when fresh has a high water and oil content. For us it is very difficult to split as the wood fibres are stringy and often the trunk and branches grow with a twist. 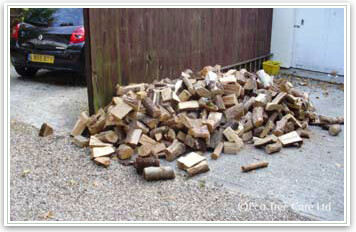 We try to split it into firewood as soon after cutting down as possible as it is relatively easier to split when fresh. Also logs only start to season properly after they have been split, and as this wood needs proper seasoning before use the earlier the better all round. The bark is pretty and when burnt does give off the characteristic eucalyptus smell. Eucalyptus logs have been said to be 'explosive' if burnt unseasoned, due to pockets of oils, not sure how accurate this is, but we have heard that it destroyed a clay chimenea when some unfortunate person tried burning eucalyptus logs from a tree they had only recently cut down. Make sure it is seasoned. An excellent firewood. Field maple logs are dense, solid and very heavy, they burn well when seasoned. Firewood Burning Properties - Hot, Solid, Slow, dependable. An usual wood, creamy and extremely dense and hard. Holly logs do indeed burn 'like wax'. (See the firewood rhymes below). It burns relatively slowly compared to other firewoods. An excellent firewood, dense and very hard. It gives out a phenomenal amount of heat, burning easily but slowly. It is a common coppice tree in Hertfordshire and Essex, so is quite commonly seen as firewood in our region. Reputably can be burnt half green, but will fizz and hiss water out of the ends, it does take a lot to season hornbeam totally. Makes excellent hardwood charcoal. A light creamy wood which gives good heat and a low flame, can spit a little, a worthy log when well seasoned. Can be a difficult log to light if even a little green. Not a brilliant firewood. A fairly good firewood when well seasoned, does have a tendency to crackle and spit otherwise. Not the best fuelwood, ok when mixed with other more dependable firewood. Good when well seasoned. Not generally rated very highly as a firewood, which is a shame as everyone knows that Leylandii grows very quickly with hybrid vigour and has helped keep the tree surgeon in business. It is worth noting that when Leylandii is thoroughly seasoned it is a perfectly respectable firewood. If it is not properly seasoned it will smolder, spit, smoke and act generally fire-resistant! Well seasoned logs are excellent to help start fires with. Not a good firewood. Smelly, and a poisonous tree, it is best avoided. All attempts are made to keep it out of our firewood log pile. All attempts are made to prevent Laburnum being added to the firewood log pile. Very rarely an Laburnum stems may inadvertently find its way into the pile, but this shouldn't happen so you shouldn't find Laburnum logs in your mix. If you have a woodburner it is not such a problem, should be avoided with an open fire. Norway Maple - Acer platanoides. Like other Acers makes good firewood. Requires ample seasoning, but becomes an excellent firewood, one of the best. It is slow to burn and not ideal with just oak logs, it can take several hours for an oak-only fire to reach satisfactory level. Best combined with firewood logs which are quicker to burn to keep the heat up and to keep it going. On a strong large fire will give an excellent return on investment as is can produce a long lasting core to an all-night fire, once a fire is established with a good ember base a few large oak logs will keep it going for a long time. If not seasoned, can be hard to light and get going and give off an acrid smoke from all the tannin. Wood needs to split into logs before it can season properly. If you find that some of the oak you receive is still not ready, put it to one side and store for another year or two, it does take a long time to season, best after 2 to 3 years. Not a bad firewood log when well seasoned. It has a unfair bad reputation as it can occasionally spit because of the resin that it contains but in Scots Pine at least the resin acts like a wax to the wood as a wick, resulting in the flames being much fiercer and larger than one would expect. It does have a good smell. An excellent quick pretty flame. A good addition to the fire and welcome in any log pile, just ask someone from Scandinavia they like pine. A good hot burning firewood akin to others of the Prunus genus. Heavy and dense long lasting logs. Good smell. Must be well seasoned to be come even an average firewood. Not highly rated as it has a tendency not to burn very well and smolders. Because it burns slowly it is used for matchsticks.You certainly wouldn't want to have to make a fire with just poplar, however if burned in combination with other well seasoned, 'quicker' burners it burns okay, gives up its heat, and so all is well as a firewood. It does make excellent kindling if split down, because it is a slow burner, and holds its flame when dry. Good hot, slow burning golden firewood. Dense and heavy logs. Very pretty grain. A surprisingly excellent firewood. Burns very very hot, with little ash. Does burn quite quickly, good logs makes excellent charcoal. One of Ben Law's favourite firewoods. Rowan makes a good hot fire, which burns slowly. Best in combination with other firewood. Lightweight logs tendency to burns very quickly with a crackles. Good smells though. Useful in the mix with others which are slow to burn like oak logs. A good firewood when properly seasoned. It can spit especially if still a little wet, which is why it has developed a bit of a bad reputation with a few people. It is generally an underrated firewood that is an excellent hard, dense firewood - good for wood burners where of course spitting is of no concern. The thick bark means that it requires cutting and splitting into firewood and seasoning for at least 2 years. A good firewood like the other acers. Splits well, and dries quickly. A common 'weed' tree to be dismantled and felled as it is quite invasive, grows very quickly and does not make a good tree for small back gardens which is often where it can be found, self-set, outgrowing its position and creating a lot of shade with its large leaves. In its defence it is a magnificent tree in parkland and field, it comes into its own when it has the space to grow to maturity. Must be seasoned, not good at all green. A poor to medium firewood, with a not so pleasant smell. Hard to get going. Only marginally better than elm. Not unlike holly when it burns with a waxy quality. The flame is bright, yellow and quick with blue/green flickering. It burns slowly to give a 'charcoal briquette' which is long lasting and leaves little ash. Nice and hot. However it is very very unlikely that it is found in a firewood pile, wild service tree is one of the UK's rarest native trees, only occurring in semi-natural ancient woodlands or where planted as a specimen tree. When they are discovered in woodlands they are to be treasured, not cut down and logged up for firewood. We only had some because we were looking after a woodland near Maldon in Essex and a large branch from a Wild Service Tree had split off and blocked off a main track. Logs must be seasoned very well to become an average firewood. Burns very quickly with not a great amount of flame. If at all green it is completely useless. When seasoned an excellent fire starter. A slow burning firewood, the logs are dense and hard, gives off a great deal of heat. Good aromatic smell. Ultimately though, it is the quality of the seasoning, the splitting and the size that will give you a good fire. In the cold regions of our planet they have only conifers like pine and they manage to keep themselves warm and have got along just fine burning pine and spruce logs as firewood.